A complete grammar text for young students, First Language Lessons for the Well-Trained Mind, Level 2 uses dictation, narration, picture study, and other classical techniques to develop language ability. From nouns and verbs to punctuation and capitalization, these easy-to-use, scripted lessons will give your child a solid foundation in grammar and clear communication. 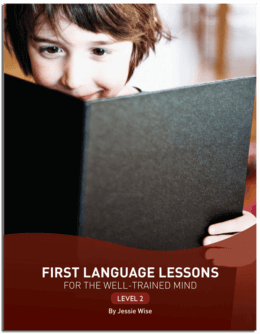 Originally published along with the first level of First Language Lessons as a single volume, Level 2 has been redesigned as a simple-to-use one-year program. Level 2 is an oral grammar program. Combine with Writing With Ease for a full grammar and writing program. If my 7.5 year old child is entering second grade and has completed All About Reading Level 1 and All About Spelling Level 1, should I start at Level 1 or 2 for WWE and FLL? My 8 1/2 year old daughter has completed Language Lessons for Today Grade 2 (My Father’s World). I’m trying to decide what level she’d start with FLL. I assumed Level 3, but after reading some of the Q&As, I’m uncertain if I might, actually need to start with Level One or Two?? If she’s successfully completed “Language Lessons for Today, Grade 2,” then she could start FLL at Level 3. There might be a couple of new-to-her concepts at the beginning, but they’ll be reviewed before the book moves on to brand-new material. I just beginning to homeschool my children who completed K and 2nd grade in public school last spring. Which levels would you recommend me starting at for both of them? My son (6) is just beginning to learn to read and my daughter (8) can read chapter books with ease! We would suggest starting with First Language Lessons, level 3 for your 8-year-old. For your 6-year-old, start SLOWLY with First Language Lessons, Level 1. It may be that his reading needs to get a bit stronger before he tackles FLL. There’s plenty of time. I have a 7.5 year old who will be starting 2nd grade and Classical Conversations in the fall. We’ve done Abeka for two years at home and she is reading chapter books beyond her grade level. She also has beautiful cursive. Should we use FLL level one and WWE? Start FLL with Level 1, and WWE with level 1 also. For this student, we would suggest starting in First Language Lessons 3, and Writing With Ease 2. My daughter will be 8 this fall. We have completed level one and portions of level two for review, but we took a break to adapt a gentler pace as she was only six going on seven at the time. However, now that she is entering third grade I am not sure whether to go back and cover level two or begin with level three. It would certainly not hurt to have the review of level two, and I’m hesitant to start diagramming sentences at 8 years of age so as not to push her too quickly… do you have any recommendations? We would recommend NOT rushing. Go ahead and finish level 2, to make sure she really masters the skills, before going on to level 3. My daugher will be entering the Second grade this fall. Does she need to complete Level one before we start Level two or can we jump in at level two? For FLL, you should start a 2nd grader in level 1. Work through that level this year, then skip to level 3 for her third grade grade. This is because levels one and two were originally combined in the same book. We broke them up for consistency and ease of use with our other materials. So, level two assumes the student has already gone through level one. Level three thoroughly reviews everything found in levels one and two (at a third grade pace) before introducing sentence diagramming. Is there a workbook for the level 2 First Language lessons ? No, there is not. Everything you need for the Year 2 lessons (except a pencil and scratch paper for some lessons) is in this Year 2 book. This answer above was very helpful! So, my next question is what are the major differences between First Language Lessons and the Grammar curriculum? My goal: I have a second grader and I want to help him prepare for Classical Conversations Essentials program. First Language Lessons is a grammar program for students in elementary grades (1-4 or 1-5). The “Grammar for the Well-Trained Mind” curriculum is for students in 5th grade and up. I’m still unclear the differences between Writing with Ease and First Language Lessons. I found a chart online of each curriculum level compared with grades, etc. We have WWE and I can’t figure out if FLL is something that would compliment or repeat the information. Thanks for asking! FLL is grammar, so it covers parts of speech (nouns, verbs, etc), punctuation, capitalization, etc…how sentences are formed. WWE covers composition. That includes reading comprehension, summarizing what you’ve read, composing short paragraphs. If you are using both FLL and WWE, you can skip the FLL exercises called “Narration” or “Dictation” because you’ll get plenty of that in WWE. Hello, My 8 year old daughter has completed FLL 1 and 2. She has begun Saxon Grammar and is doing well. Should I be worried about any learning gaps because she didn’t complete FLL 3 and 4 before moving onto Saxon? Thank you! No need to worry…Saxon is a good program. And since she’s 8, she’s got plenty of time to learn the various components of grammar.